Gaston is a rich Parisian who wants to break from the traditions of his family. He finds refuge in his time with Gigi, a young girl raised by her aunt and grandmother to be a rich man's courtesan. For quite a while, the two see each other as siblings, nothing more. Over time, Gaston comes to the realization that Gigi has grown up. Can he really bear to take her as his mistress? Not to be confused with Gigli. All-Knowing Singing Narrator: Honoré Lachaille. Be a Whore to Get Your Man: This was what Gigi was raised to be; it wasn't until she started dressing more her age that she won Gaston. The Film of the Book: Colette was an insanely successful writer in her day, beginning with the scandalous Claudine at School, written when she was about Gigi's age. 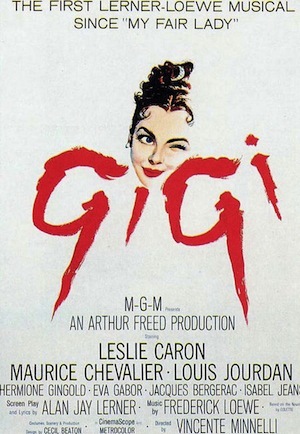 Gigi was only one of her many, many bestsellers. Today, if it weren't for this film, she'd probably be completely forgotten. Fourth Date Marriage: Subverted. While Gaston and Gigi go on maybe one date before the proposal, they've known each other for most of their lives, and have gone on several non-dates. The Gay Nineties: This film, its predecessor film and stage adaptations, and the original novella, are all dripping with nostalgie for la Belle Epoque. He Who Must Not Be Seen: Gigi's mother. High-Class Call Girl: Mamita would prefer that you not use such words, but Gigi is being raised to become just this. Screen to Stage Adaptation: Later got a stage version in the seventies. She's All Grown Up: The whole point of the plot, basically lampshaded in its title number. ↑ Not counting the latter's two special awards.